Our new oxygen room is now open. It is a relaxing environment where people can sit quietly, both after counseling sessions or anytime, to breathe over 80% pure oxygen from a nasal cannula (nose hose). The air we normally breathe contains about 21% oxygen the rest is Nitrogen, Argon and other trace gasses. The oxygen in our oxygen room is between 80-95% oxygen, allowing our clients to breathe 4 to 5 times the normal amount of oxygen thus giving them an uplifted refreshed feeling as well as increased energy, detoxification and a general overall good feeling. In just 15 to 20 minute session, oxygen can displace harmful free radicals, neutralizes environmental toxins, and destroys anaerobic infectious bacteria, parasites and microbes. It gives the body the ability to rebuild itself, detoxifies blood, increases circulation and strengthens the immune system. Oxygen will heighten concentration, alertness and help fight off depression and anxiety. It has been known to help with relaxation and sleep disorders, prevent disease, relieve hangovers, and alleviate headaches. A 20-minute oxygen session is ideal for optimum results. A 5 or 10 minute session is perfect for students getting ready for an exam and is ideal for trade shows and weddings or corporate events, when you just want to give people a sample session. Medical oxygen is 100% pure oxygen and you must have a license to dispense and a prescription to receive. Our oxygen bar dispenses commercial grade oxygen, which is around 92% pure oxygen. These guidelines include using NO medical equipment or medical supplies and making NO medical claims. Recreational oxygen falls under the Supplemental Act of 1994 that allows supplements such as herbs and vitamins, as seen on the shelves of health food stores, to be sold over the counter to perform different functions without being evaluated by the FDA. (That is why you see on all of these products, including oxygen bars, disclaimers that say “These statements have not been evaluated by the FDA”). Our oxygen room is one that dispenses oxygen through personal non medical, new nose hoses. A recreational oxygen room is not intended to diagnose, treat, cure, or prevent any disease or illness. Persons with any medical condition such as a lung disorder, asthma, emphysema, COPD, or pregnancy should consult their physician prior to use of a recreational oxygen room. The benefits included are increased energy, an uplifted refreshed feeling, clearing of the mind, relief of toxic headaches, hangovers, relief of stress and promotion of higher concentration levels. 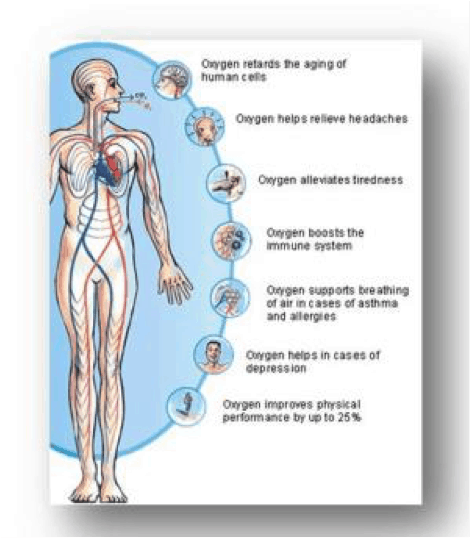 Oxygen is also a proven detoxifier and has anti-aging properties. Note: There are a small number of physicians in the medical community, who offer opinions on oxygen rooms as oxygen therapy and the safety of long-term oxygen treatment. There is NO evidence that oxygen used in rooms can be dangerous to a normal person’s health. Oxygen rooms have been in existence for over 15 years and are popular in several countries; millions of people have enjoyed oxygen sessions around the world without a single health related incident or lawsuit. Oxygen rooms are not intended to treat, cure, prevent or diagnose any illness or disease.